Why did I never see Strange Brew until its DVD release in 2002? Good question, one I’m not sure I can answer. After all, I fell strongly into the film’s target audience. I followed SCTV literally since its mid-Seventies inception, so I knew of the McKenzie brothers from day one of their existence. Created north of the border, authorities told the folks at SCTV that they needed some uniquely Canadian content, and the stereotypical beer-swilling and hockey-loving McKenzies came as the series’ nose-thumbing result. Actually, I should probably resent the McKenzies, for I believe their popularity hastened the death of the show. However, I don’t feel too bitter. SCTV lived fast, died young, and left a beautiful corpse. Had SCTV continued, the quality probably would have declined, so I’m happy with the memories and videotapes of the original shows. In any case, the Bob and Doug fad proved to be short-lived. In fact, the bloom was already off the rose when their feature film Strange Brew hit screens in August 1983. The McKenzies peaked in early to mid 1982, so by late 1983, much of the public had moved on to other comedic trends. I hadn’t - I’m pretty loyal about these things - so I still have no clue why I didn’t see Strange Brew theatrically. This must remain unexplained, I suppose, but it remains a fact that I never checked out the movie until 2002. Frankly, I wish I’d continued to pass on it. While not a total dud, Strange Brew seems like a fairly uninspired and bland affair that doesn’t do justice to the SCTV legacy. Strange Brew does start promisingly, however. Bob (Rick Moranis) and Doug (Dave Thomas) make their own movie, but it ain’t Strange Brew. Instead, we see their sci-fi opus The Mutants of 2051 AD. This goes over poorly with the audience, and after the boys give away their dad’s beer money as a ticket refund, they need to find away to get him some brew. They attempt a scam that involves a mouse in a beer bottle, and it actually works much better than expected. In addition to some free beer, it lands them jobs at Elsinore Breweries as bottle inspectors. Along the way the boys meet Pam Elsinore (Lynne Griffin), the daughter of the recently deceased brewery patriarch. She wants to exert her legal control over the place, but Brewmeister Smith (Max Von Sydow) and Pam’s Uncle Claude (Paul Dooley) - the new president of the company - oppose her. They do so mainly because they plan to use Elsinore beer to take over the world via a mind-control drug. To experiment, they use residents of a neighboring mental institution. Accidentally and inevitably, the McKenzies start to stumble onto the scheme, so the baddies frame them. From there, the boys need to clear their names, stop the insidious plot, and also get drunk. The McKenzies came from a modest place, and they deserved to stay there. Via their short “Great White North” programs on SCTV, they proved funny as we heard their warped provincial attitudes. Brew mixes in some of those moments, but mostly it comes across like something created by a couple of guys with too much time on their hands. Moranis and Thomas directed Brew, which sounds like a good idea but probably isn’t. I get the feeling they tried too hard to make a big flick that offered all things to all people and forgot the comedic roots of the characters. To my surprise, Brew includes no SCTV regulars other than Moranis and Thomas. Those folks constantly appeared in each others’ projects, so it seems odd that Moranis and Thomas didn’t carry over any of their old collaborators. Perhaps this resulted from an attempt to do their own thing, or maybe they burned some bridges when they quit the show. However, I think the isolation hurts the project, as additional comic inspiration would have been useful. Other than Moranis and Thomas, Brew includes a pretty lackluster cast. Actually, it features good performers in Dooley and Von Sydow, but neither stands out here. Dooley tries to hard to get his odd hair and dye job to act for him, while Von Sydow can’t decide if he should go for laughs or play it straight. Griffin seems like a virtual non-entity, as she demonstrates zero personality or charisma. 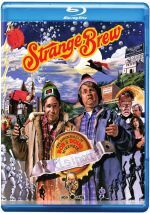 Overall, Strange Brew occasionally provides some laughs, but the expansion to the broad James Bond style plot doesn’t work for the characters. Instead, it overwhelms the modest charms that made them popular in the first place. 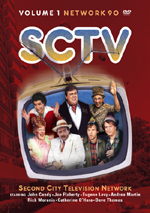 During one episode of SCTV, the network exploited the McKenzies’ popularity via a star-studded prime-time special. Inevitably, it tried to make them something they’re not and it flopped. Moranis and Thomas should have learned a lesson from that program, but apparently they thought they could rise above those limits. Strange Brew proves that assumption to be incorrect, as it turns into a forgettable mess. Strange Brew appears in an aspect ratio of approximately 1.85:1 on this Blu-ray Disc. The dated nature of the original photography held back the image, but it mostly looked pretty good. Sharpness was largely fine. Some shots could be a bit tentative, and I can’t claim the movie boasted razor-sharp delineation. Nonetheless, it displayed appropriate definition the majority of the time. I saw no jagged edges or shimmering, and edge haloes remained absent. Print flaws also failed to become a distraction. Colors appeared acceptable. The movie tended toward somewhat pale hues, which again seemed to reflect the source. The hues lacked much vivacity but they came across reasonably well. Blacks were fairly rich, and low-light shots delivered decent clarity. Nothing here excelled, but the image seemed satisfactory given the source limitations. On the other hand, the DTS-HD MA monaural audio of Strange Brew provided a weak affair. Speech always remained intelligible, but dialogue tended to seem brittle, and I also noticed a fair amount of edginess to the lines. Effects showed a little distortion and generally appeared flat and lackluster, without any heft or range. Music was a little stronger, but not by much, as the score and songs appeared fairly thin and bland. Even when I accounted for its age, this was a flawed soundtrack. How did the Blu-ray compare to the original DVD? Audio was fairly comparable, as the lossless mix couldn’t do much to fix the problems found in this rough recording. On the other hand, visuals worked much better on the Blu-ray. It provided better accuracy and clarity as well as a much cleaner presentation. Even with its limitations, the Blu-ray delivered obvious visual improvements. The Blu-ray reproduces most of the DVD’s extras – which means we don’t find much. Easily the best of the bunch, we get the Great White North episode from SCTV that inspired part of the movie’s plot. Entitled “How to Stuff a Mouse In a Beer Bottle”, this two-minute, 23-second piece offers more laughs than the entire film on which it was partially based. In addition to the theatrical trailer for Strange Brew, we discover a four-minute, 47-second promo for The Animated Adventures of Bob and Doug McKenzie. A preview for a short-lived series, this piece introduces us to the cartoon brothers and their pals. It would’ve been better to at least get a full episode, not just a teaser. After a promising start, Strange Brew quickly becomes bogged down in a silly and lifeless plot. This negates the compelling elements of its main characters and overwhelms them with useless story information to the detriment of the comedy. The Blu-ray offers pretty good picture along with iffy audio and a minor selection of bonus materials. Strange Brew enjoys a good cult following, but I can’t figure out why.